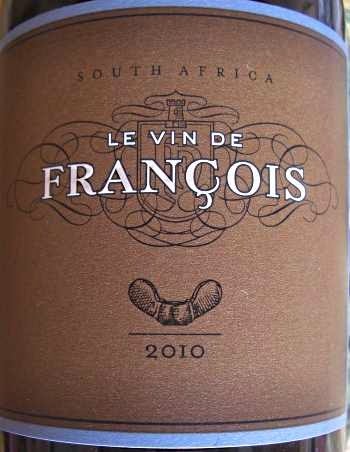 My wine on the month for April is Le Vin de Francois 2010 that I had several times when lunching at Delheim Winery during my recent stay in the Cape. 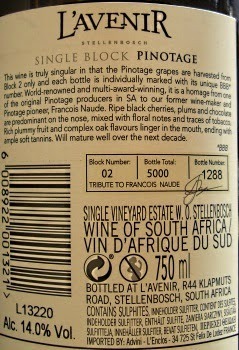 It's the wine of Francois Naude, made from barrels he's selected from seven top Pnotage wineries to blend together into a superb example of Pinotage. 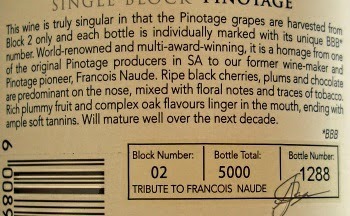 Francois Naude made his name at L'Avenir Estate. While her he won the Pinotage Top 10 Competition more times than anyone else. His retirement didn't last long: soon he was consulting at wineries and then creating his own wine from the best barrels he encountered. 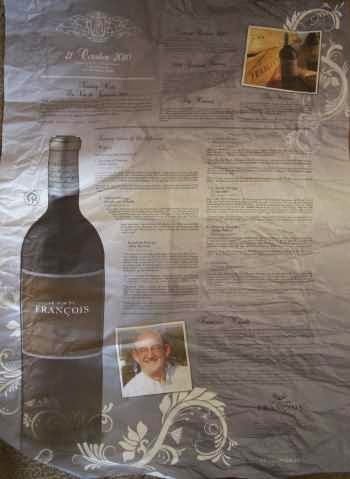 The wine is sold at an annual auction. The only other way to get hold of a bottle is from a reseller and Delheim -- which regularly supply barrels -- had a few bottles for sale in their tasting room which I was delighted to buy. 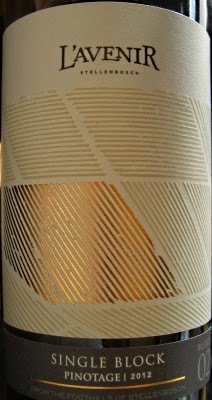 The label might not be informative, but the bottle comes wrapped in an A3 sheet of paper, see below, which details this wine and the various wines and wineries that supplied the barrels. This wine is 100% Pinotage, a blend of two barrels from Beyerskloof (winemaker Anri Truter), Kanonkop (Abrie Beeslaar ), Lanzerac (Wynand Lategan), and one each from Delheim (Brenda van Niekerk), L'Avenir (Tinus Els), Simonsig (Johan Malan), and Wildekrans ( William Wilkinson). Widekrans is in Bot River, the others are Stellenbosch. 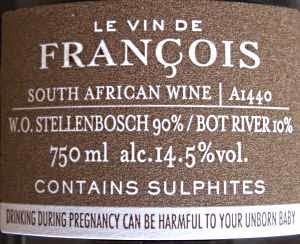 I love Francois' wines, he is a consummate master of Pinotage and this wine is a revelation. It was probably not doing it justice to drink it so young, but I couldn't resist, and I couldn't take them all home. Paired with Delheim's Garden Restaurant Cape Malay curry this wine danced on my tongue. There's so much depth of flavour with dark plums to the fore and a long lingering finish. Gorgeous stuff. Not cheap, but worth every penny.